I started by mixing the flour, yeast and salt in a large mixing bowl. Once they were well mixed together I then made a well in the middle and poured in the warm water. I poured all of the water in at once, the mixture was very sticky at first and I panicked a little that I had fallen at the first hurdle. But after a few minutes of mixing and deep breathing it started to come together nicely. 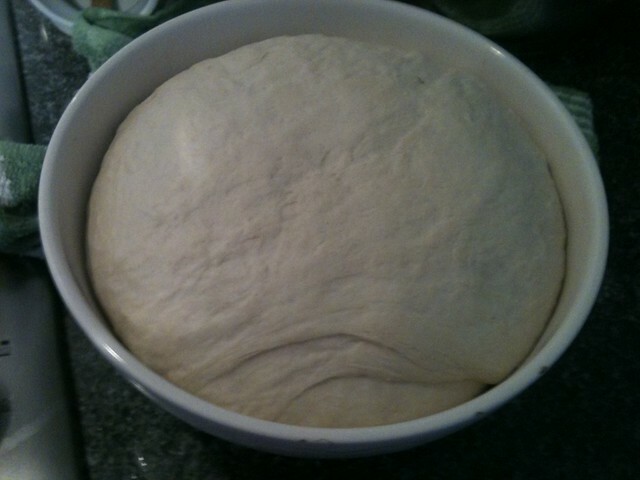 Once it was not as sticky, I turned it out onto a floured surface and started kneading. The mixture was still quite wet so I did add a fair bit more flour at this stage. I was convinced it was all going to go wrong and I could hear Paul Hollywood's voice in my head telling me it was going to be dry and too tough if I added too much flour. 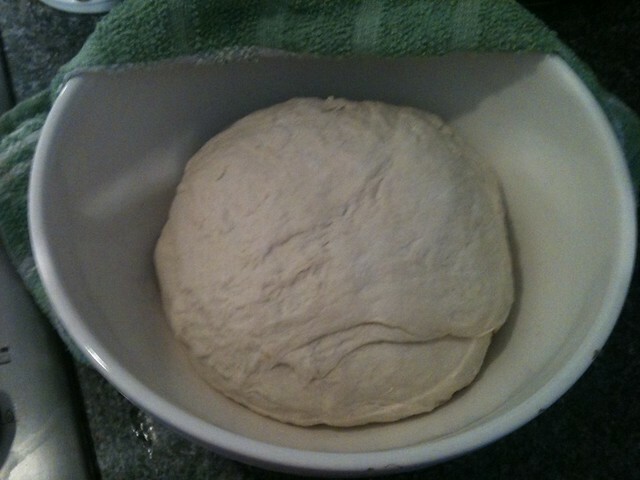 After about 10 minutes of kneading and flouring it actually started to resemble bread dough! So, I rolled it into a ball and popped it back into the bowl, covered with a damp tea towel and left to rise for about 3-4 hours. Then the recipe stated that I should punch the dough to let out some of the air, which felt a bit weird but strangely cathartic. 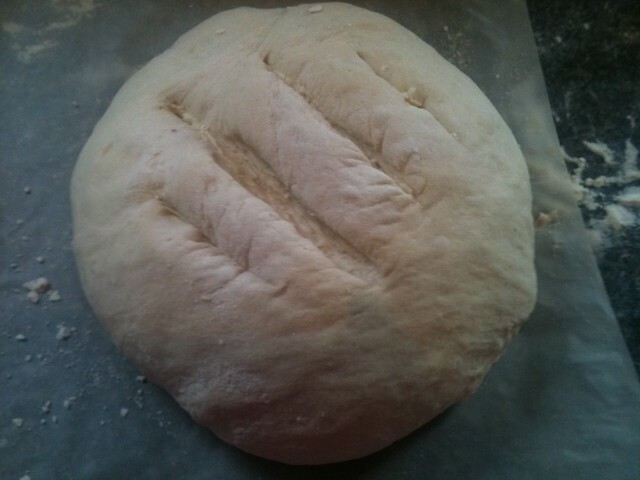 I then turned it out onto a flour surface for another round of kneading. The bottom of the dough was still a little sticky so was a bit reluctant to leave the bowl, but after some strong words and a bit of coaxing it came out fine! I then split the dough into two equal sized balls (I even weighed them to be extra precise) and kneaded for a further 5 minutes. Once the kneading was done I rolled them into balls and left them on the bench under a damp tea towel to rise for a further 2 hours. I popped them on greasproof paper. 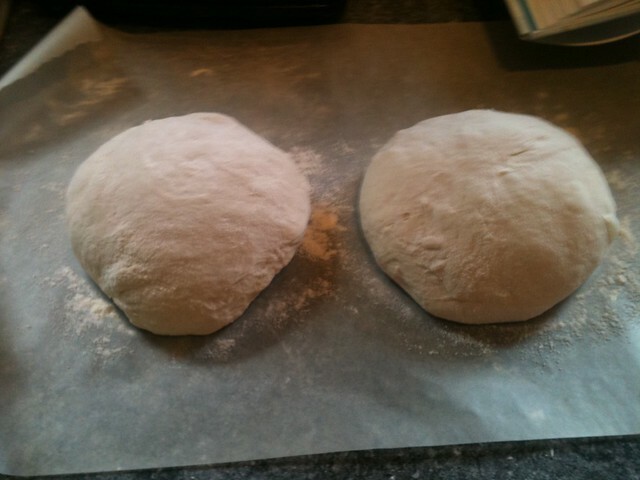 Once risen they were ready for baking! I made a couple of knife cuts in the top, although I probably need to invest in some sharp knives or a sharpener of some sort. Before they went in the oven I preheated to 230 and warmed the baking sheet, I also placed a deep roasting tin in the bottom of the oven. Once the baking sheet was sufficiently hot I placed the bread onto it and put it in the oven. I then poured a small jug of cold water into the roasting tin which created steam. Apparently this does something to the crust, I am not sure what but Hollywood told me too, so I did it. After 15 mins I turned the oven down to 200 and baked for a further 15-20 minutes, I then took the loaf out and tapped the bottom to check it made a hollow noise. I wasn't really sure what noise I was looking for, but it sounded hollow to me and looked golden and lovely! The second loaf was in about 7 minutes longer, and I think it tasted a bit better, less dense/doughy. 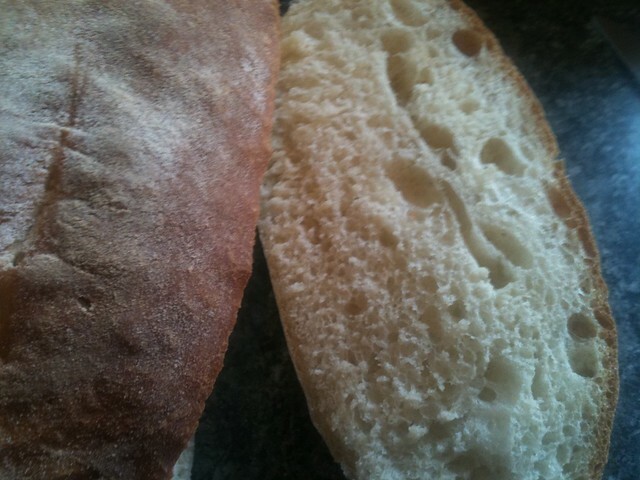 As you can see the one on the left was cooked a little longer, and looks more golden and crisp. 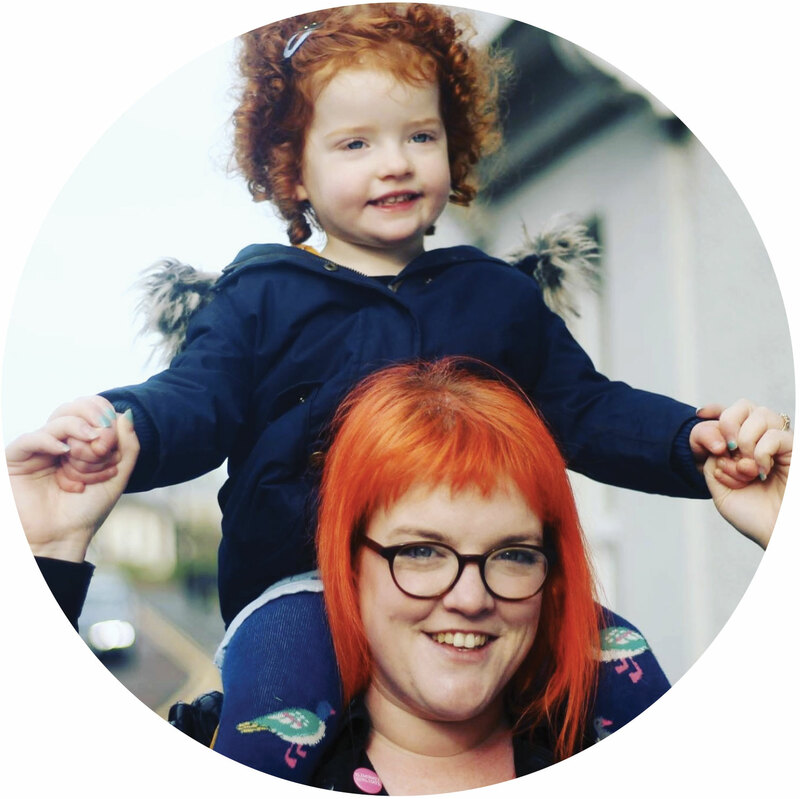 Although this blog post makes it sound like it was quite hard work, it was actually surprisingly easy and as there was a lot of time between rising and baking it allowed me time to prepare other things and get the housework done. 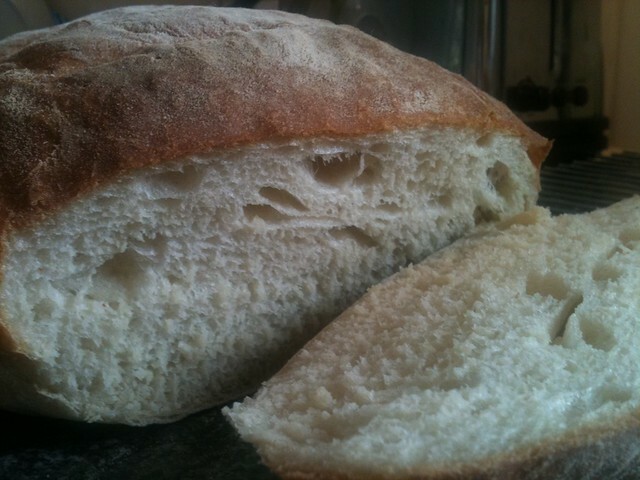 I am definitely going to make bread again, I really enjoyed it and it went down very well! It was perfect for packed lunches and kept really well. Oh look at that crumb! I want to try shaping the dough into a proper loaf shape, making bread rolls and then maybe a wholemeal or granary version. 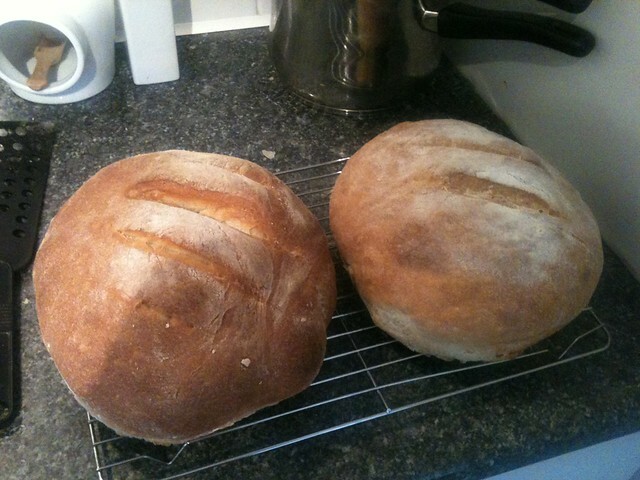 I've started making bread recently too. My loaves come out rather small though so need to alter my recipe. Bought the Bake Off book yesterday, it's great. Well done on your first loaf, I've been baking bread today too. I love making bread, its so straightforward. Tried Paul's focaccia last week and after his insistence that all the water must be added, I did as I was told. I've never seen such sticky dough, it was really difficult to knead, and didn't rise as much as I expected. Tasted good though, and I will be trying it again! Ooh your bread looks gorgeous. I've always thought that baking your own bread was a bit of a 'faff on' to be honest, but this looks worth a bit of effort! There's nothing better than a big chunk of freshly baked bread. Yum. 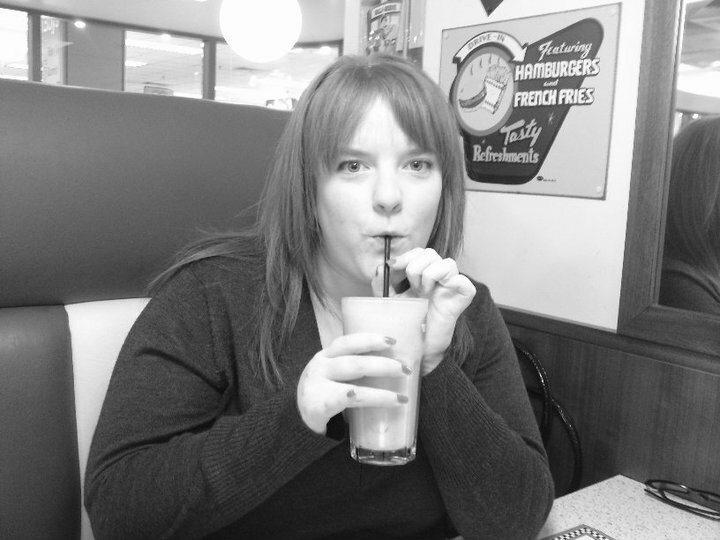 Now I'm hungry! :) I cheat with a bread maker. Your bread looks great, especially if you haven't made any in a while. You will have the bug now and will be baking a loaf three times a week, I guarantee you. Well i have taken your advice and my dough is proving as i type!! Fingers crossed!! 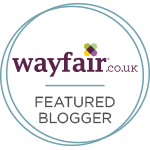 Loved the post! !